Although it doesn't seem like it's been a year since our last Best of Houston® issue, the time has come once again to cast your votes for the city's longest-running reader poll of our best restaurants, bars, dishes and drinks. 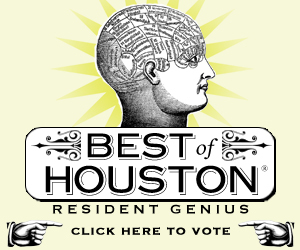 The theme of this year's Best of Houston® -- our 23rd year in all -- is Resident Genius. We'll be recognizing dining and drinking ventures across the city that have been innovators in their field, places and people that have revolutionized the way we eat. But we also need your votes for the Readers Choice awards. Does The Breakfast Klub still have the best breakfast in town? Is the best pizza still at Star? Who will get your vote for the year's best new restaurant? It's all up to you. Head over to our Best of Houston® poll and cast your votes now. It's open until September 14, with winners announced in our annual Best of Houston® issue on September 29.